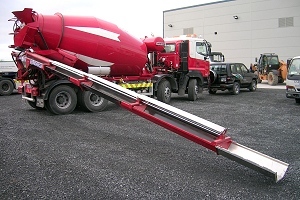 Truck MixLayer | Truck Mixer Tele-Chute System - Value Tech Ltd.
Value Tech offer a range of truck and transit mixer telescopic delivery chute systems. The basic model is the VTC 55 which replaces the conventional discharge chute arrangement of most conventional truck and transit mixer. This unit is a robust steel construction with manual swivel and clamp mechanism but with a hydraulically operated lift and telescopic functions. With the compact minimum retracted length of 1.5 meters combined with 3 meters of telescopic extension plus an additional one meter hook in extension this version can provides a total reach of 5,5 meters including 3 meters of telescopic movement. It can be equipped with independent manual control system or alternatively integrated with the truck mixer functions with special radio control system. Maximum Delivery Depth 2.5 meters. Nett Additional Weight 350 Kgs. The alternative Value Tech tele-chute system with additional features is the VTC 95. This model supersedes VTC 100T. This equipment is installed completely independent of the conventional truck mixer discharge chute configuration. 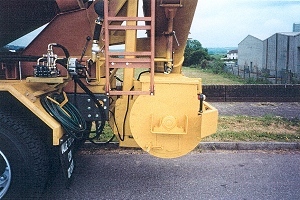 i.e the standard chute system also remains with the truck mixer. The VTC 95 is manufactured for high tensile steel with wear resistance liners on main section. All functions are hydraulically operated and integrated with truck mixer control by way of full radio remote control system. Both the telescopic chute and the mixer can be manually operated in the unusual event of power failure. The VTC 95 has a minimum retracted length of 3 meters and hydraulically operated telescopic movement of 5 meters. An additional one meter extension chute in additional to pipe adaptor is also supplied as part of the system. This gives a total outreach of 9.5 meters inclusive 5 meters of telescopic movement. The VTC 95 in transport position can be positioned on either left or right side of truck mixer depending on equipment, customer preference, or other relevant criteria. Total Outreach 8 meters + 1.5 meter. Maximum Delivery Depth 4 meters. 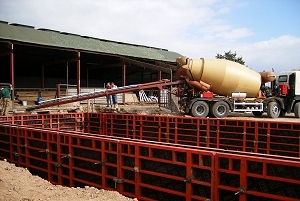 The Mixlayer is a specially constructed truck mixer body inclusive telescopic delivery chute. The mixing drum is designed in such a way as to consume minimum power from truck engine and provide maximum stability with low centre of gravity for optimum road handling better stability. The mixing drum is constructed from special wear resistant steel providing increased durability and extended life while the integrated telescopic delivery chute is constructed from high tensile steel elements with wear resistant liners on main section. All electrical and hydraulic systems are integrated and fully assembled on modular sub frame for easy installation by customer or dealer on to conventional chassis cab truck. 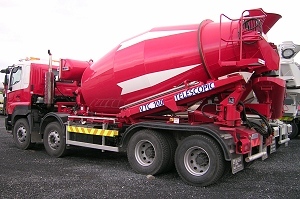 Maximum payload capacity for concrete delivery placement equipment. Easily and quickly installed most construction type chassis cab units. Fully integrated radio control operating system with manual over ride system for emergency use only. All major components manufactured by reputable European manufacturere e.g Sauer Danfoss, Bosch Rexroth. 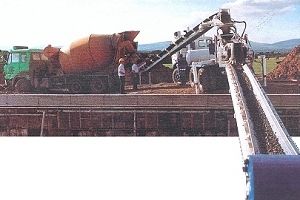 Mixing Drum with nominal capacity 8 cubic meters set concrete. Telescopic Chute minimum outreach 3.0 meters.